Dragon confronts a gang of ruthless superpowered freaks who had been slaughtering innocent homeless people in an act of rebellion to their re-creator, Johnny Redbeard, who had revamped them all, seemingly without thought to anyone. Sensation, a green-skinned bimbo states that she has been made an outcast because she communicates with people from another realm. The aquatic Sub-Human lost his ability to fly after his undersea kingdom was looted and he was given amnesia to forget his problems. Super-X retained his incredible strength but also gained the ability to repel dirt, unfortunately he also rejected soap and he has forced many people to leave his side. Lightning Bug and Fade do not reveal their pointless revamps but they are able to fly and shoot force beams, and become invisible, respectively. The hero manages to scare off his foes with a display of power. In the Megahero universe, the well-known Megatropolic Quartet learn of the existence of the Image universe and believe that that realm’s Earth has been overrun by alien forces who wear police uniforms. Megaton Man is called in to investigate but he is accidentally teleported alone to confront Dragon. 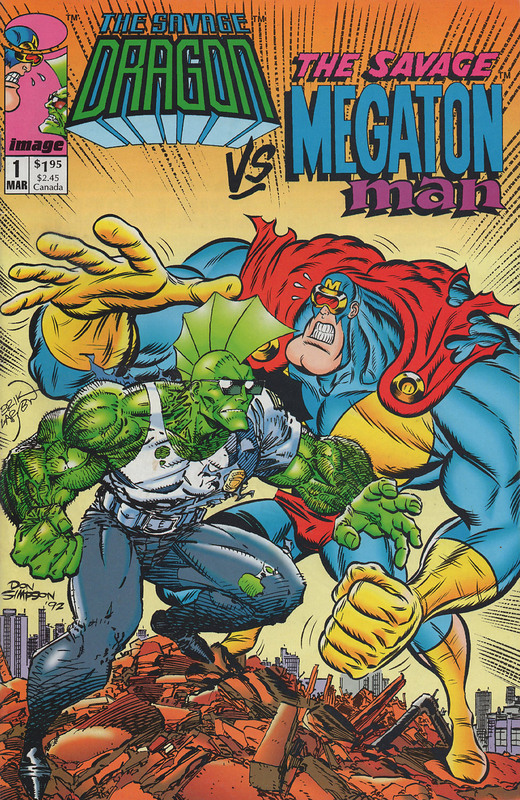 The two superhumans get immersed in the classic ’hero vs hero’ cliché until both verify themselves through either Megaton Man’s superhero identity card from his world, or Dragon’s own badge of officer for the Chicago police force. As the two men apologize for their rash actions, they become lost in a huge shadow. A huge being known as Slagg Heep attacks the two heroes but is knocked cold with a punch from them both and he is sent falling onto his partners the Nixed Men. 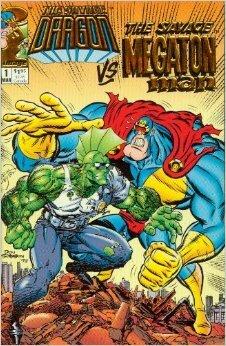 The oafish superhuman called Megaton Man is teleported home by his allies, leaving the defeated supervillains to the capable hands of his brand new ally, Dragon.